Will let players rule the galaxy. No biggie. I'm not overly keen on ruling the galaxy, as it sounds like a lot of pressure, but if you'd like to take a seat on the Eternal Throne (apparently not a toilet) and reign over a galaxy far, far away, you can now do so in Star Wars: The Old Republic's Knights of the Eternal Throne add-on. 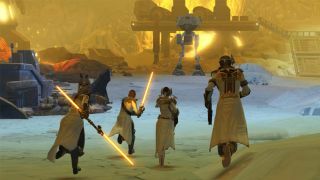 While Old Republic itself is free, you'll need to be a subscriber to gain access to the expansion, at which point you can hop into a new story and play a pivotal role in that whole light side/dark side squabble. "After conquering the throne," so says the press release, "rule the galaxy with all-new Galactic Command gameplay, featuring an evolving multiplayer progression system and authentic Star Wars action! Grow your influence across the galaxy with Uprisings, where you’ll join with three allies to fight fast-paced and explosive battles—to solidify your rule and earn rare rewards. Plus, throughout your Knights of the Eternal Throne adventure you’ll want to pick a side, as the dark and light side of the Force battle in an evolving and ongoing war. As one side takes control, battles and counter-battles will erupt across the galaxy—offering big group combat that brings players together like never before—to shift the balance of the Force to their side!" Man, when are the two sides going to hug it out, create the 'grey side' of the Force, and stop taking orders from hooded weirdos with magic powers?